Theo Randell is a good yet troubled man. His life is thrown into turmoil when he begins to experience visitations from a horrifying entity causing him to spiral further into his past life of drink and drugs. As Theo struggles to determine what is real and what is not, he manages to land a job at an old manor house providing him with a welcome escape from his increasingly maddening lifestyle. However, not everything is as it seems at the old Rose Maiden Manor and the mysterious owner demands that he must follow her bizarre requests. It is only a matter of time before Theo begins to suspect that the house has sinister plans for him and those he cares for. Theo is ultimately faced with determining whether his reality is a result of his former life haunting him or if the visitations and the strange events at the manor are somehow connected. He must uncover the truth before the revelations change his world forever. Drew Forest's debut novel THE CORPSE ROOMS is full of mystery, suspense and chilling twists and turns. It is certainly a book that you will find hard to put down as the characters are written with enough detail to make you believe in the trials and tribulations they are going through, especially Theo our main character who is a recovering alcoholic. Outside of Theo, his love interest Rhea and Theo's disabled brother Bill, there is one character who is not a person but a building and a very haunting building it is as well. This goes to show how well this book is written, as to have an object become a character in itself takes alot of skill and imagination to make happen. Rose Maiden Manor itself sounds like quite a majestic building and for me thoughts of the house from Stephen King's mini series ROSE RED (2002) was conjured up, as much like that house the manor in Drew Forest's book THE CORPSE ROOMS has a tendency to change. I would highly recommend picking this book up if you want a novel that will keep you thinking and intrigued throughout. 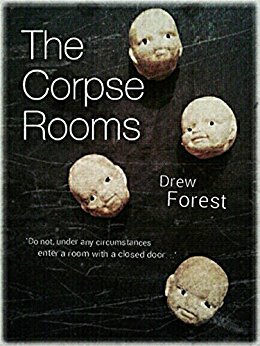 On a final note and this is no reflection on the writing skills by Drew Forest but the cover to this book simply doesn't make sense once you have read the novel. Maybe in future publishing's the book will have a more appropriate and haunting cover to suit its contents.